In 1939, The New Yorker published "The Secret Life of Walter Mitty," a humorous short story by James Thurber about a meek man who, when put upon by his wife, retreats into a fantasy world where he is an adventurer and a rapscallion. It's pretty great, and deservedly gets taught at various levels of education. The new Ben Stiller movie The Secret Life of Walter Mitty bears zero resemblance to this classic story. Screenwriter Steve Conrad (The Pursuit of Happyness) jettisons all but the title and the main character's name, and the notion that a do-nothing fellow would spend more time in his head than he would living his actual life. This Walter Mitty works for Life Magazine processing and sorting photographs. It's an isolated job. He and the photos are filed away in the back with one other employee (Adrian Martinez) working under Walter. The daydreamer has a crush on a girl in accounting (Kristen Wiig, Bridesmaids) and imagines different scenarios where he might have the guts to ask her out. Time is running short, however, as Life has been sold and is being turned into a dot.com. Most of the current employees will lose their job. Walter is put in charge of the last cover, a photograph by a world-traveling lensman (Sean Penn) that he has always admired. When the negative for the snap goes missing before it is even seen, it forces Walter to break out of his shell and go trotting across the globe in search of the only person who can tell him what the picture was and where it might be. Or does he? I suppose there is a small smidgen of The Secret Life of Walter Mitty that wants you to keep guessing whether or not our man will wake up back in his office, realizing he has had the answer all along. Not that anyone is trying really hard to keep you on your toes here. 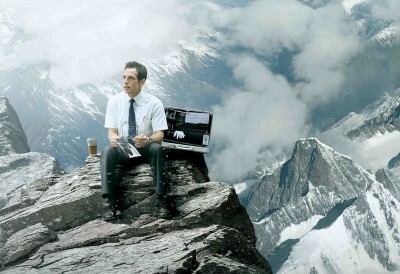 The Secret Life of Walter Mitty is pabulum by design and intention, with perfectly integrated product placement that drives the story about as much as anything that came out of Conrad's word processor. There are exactly two good scenes in The Secret Life of Walter Mitty, both of which point to a potential tone that Stiller could have taken with the film. The first good scene is the beginning of the movie, a few minutes of preamble showing Walter alone in his apartment, balancing his checkbook and trying to decide if he should contact Wiig's character, Cheryl, on eHarmony. It's almost a short film unto itself, a small piece of near-silent comedy that is pitched just right. In those scant moments, we learn everything we need to know about Walter Mitty before he even considers "zoning out" and having a ludicrous daydream. 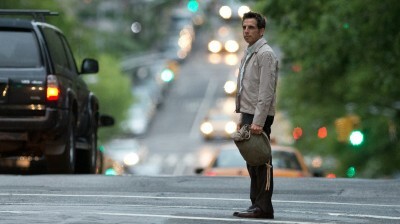 Had Stiller carried on this way, he could have made a movie full of pathos built around classic cinematic slapstick. The second scene is one of Walter's daydreams, one where he imagines himself and Cheryl as the characters from The Curious Case of Benjamin Button, only Walter gets it wrong and dies as an old baby resting against his equally aged wife's breast. It's completely ridiculous, playing on pop culture absurdities fine-tuned to the smallest detail, the kind of thing the director did on the short-lived, but excellent, The Ben Stiller Show or the movie parodies in Tropic Thunder. More flights of fancy like this one would have meant another high-octane comedy of exaggeration, the kind of stuff the comedian is best at. Instead, The Secret Life of Walter Mitty seems geared toward the filmmaker and star's Night at the Museum audience. It's safe and carefully crafted to avoid offense, working on false sentiment and empty nostalgia. There is a self-aggrandizing desperation to how badly Stiller wants you to see his Mitty as a bastion of a fading culture and times past. Not just the idea that Life Magazine will become Life Online (the pun being, "The End of Life! "), but there are other callbacks to missed opportunities in childhood and the teen years, symbolized by outdated references to Stretch Armstrong and Fonzi and a cloying appropriation of punk rock and skateboard culture. This makes it all the more ironic that Stiller and Co. would so callously dismiss Thurber's story, which has stood the test of time for over 70 years and is considered one of the most influential pieces of comic writing from the first half of the 20th Century. It's also a bit telling that The Secret Life of Walter Mitty takes a knock at The Curious Case of Benjamin Button, which I've always argued did the opposite of what Stiller and Conrad have done, taking a strange F. Scott Fitzgerald short story and using it as a springboard to create a larger take that peddles in the grand themes of Fitzgerald's bibliography. David Fincher pays loving tribute to the source author, whereas Ben Stiller callously dismisses that fuddy duddy Thurber because he thinks he's figured out a better way. Folks should be as incensed about this as they are about Peter Jackson's ego-feeding expansion of The Hobbit. They are the filmmaking equivalent to foie-gras farmers who nail a duck's feet to the floor and force-feed it until it becomes obese. All of which wouldn't really matter if The Secret Life of Walter Mitty was a good movie. Plenty of other adaptations have strayed far from the source material and created their own thing. It always prompts me to wonder who the executives sold on the idea of resurrecting such a thing think they are then marketing this "known quantity" to. But whatever. The fact of the matter is, The Secret Life of Walter Mitty is bland, unfunny, and not at all romantic. It's also wholly unimaginative. 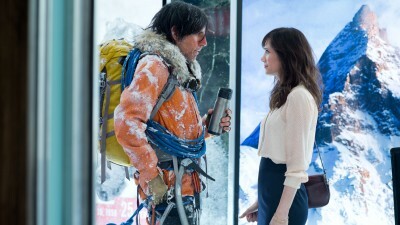 Stiller drags himself through well-worn, predictable scenarios without really adding to any of the clichés he's adopting. His is a vision quest a la Forrest Gump, but without the history or any sincere belief in anything more than the power of ticket sales. If going this route, why not actually use the ubiquitous Life Magazine covers in Mitty's workplace and have Walter climb inside? I know it's bad form to critique a move for what it isn't rather than what it is, but The Secret Life of Walter Mitty fails so miserably to hold one's attention, it's hard to stay on topic, I keep having better ideas. The Secret Life of Walter Mitty is a movie so regressive in its conception and so transparent in its marketing, it's a wonder that it wasn't produced by Happy Madison. I certainly hope Stiller followed Adam Sandler's example and gave Kristen Wiig a car for signing on to this stinker. Of all the crimes The Secret Life of Walter Mitty commits, relegating her to the pointless love interest role, sidelining her for the vast majority of the movie, that one is certainly the worst. The man has his fun and learns his lesson, and the girls stay at home being bored. Let's have some movies about their secret lives. They certainly have to be better than this! Order "The Secret Life of Walter Mitty (2013)" now!